Buchanan, George (1923). My mission to Russia and other diplomatic memories. Cassell and Co., Ltd., London, New York. https://openlibrary.org/books/OL6656274M/My_mission_to_Russia_and_other_diplomatic_memories. Figes, Orlando (1996). A People's Tragedy. 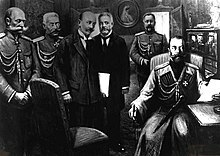 The Russian Revolution 1891–1924. Jonathan Cape. ISBN 0-224-04162-2. Fomin, Sergei Vladimirovich "Grigorij Rasputin: Rassledovanie": Volume 1: "Наказание Правдой" (2007); Volume 2. "А кругом широкая Россия…" (2008); Volume 3. "Боже! Храни Своих!" (2009); Volume 4. "Судья же мне Господь!" (2010); Volume 5. "Ложь велика, но правда больше..." (2010); Volume 6. "Страсть как больно, а выживу…" (2011); Volume 7 "Милые, дорогие, не отчаивайтесь" (2013). Fuhrmann, Joseph T. (2013). Rasputin, the untold story (illustrated ed.). Hoboken, New Jersey: John Wiley & Sons, Inc.. ISBN 978-1-118-17276-6. Hoare, Samuel (1930). The Fourth Seal. William Heinemann Limited. https://archive.org/details/fourthseal031079mbp. Out of My Past: Memoirs of Count Kokovtsov. Stanford University Press. ISBN 978-0-8047-1553-9. https://books.google.com/books?id=aiykAAAAIAAJ&pg=PA303. Purichkevitch, Vladimir (1923). “Comment j'ai tué Raspoutine”. J. Povolozky & Cie. http://gallica.bnf.fr/ark:/12148/bpt6k17591c/f756.image. Radzinsky, Edvard (2010). The Rasputin File. Knopf Doubleday Publishing Group. ISBN 978-0-307-75466-0. https://books.google.com/books?id=_aXwT3vq45cC&pg=PT597. Helen Rappaport (2014) "Four Sisters. The Lost lives of the Romanov Grand Duchesses". Pan Books. ^ Radzinsky (2000), pp. 25, 29. ^ Gerald Shelley (1925) The Blue Steppes, p. 87. ^ Chapter Five. Rasputin. Alexanderpalace. Retrieved on 15 July 2014. ^ Iliodor (1918), p. 91. Archive.org. Retrieved on 15 July 2014. ^ Radzinsky (2000), p. 57. ^ H.C. d'Encausse (1996) Nicolas II, La transition interrompue, p. 147, (Fayard) ; Holy People of the World: A Cross-cultural Encyclopedia. ^ Helen Rappaport, p. 112. ^ a b c d e Alexanderpalace.org. Retrieved on 15 July 2014. ^ Helen Rappaport, p. 181. ^ Helen Rappaport, p. 179. ^ Петербургские квартиры Распутина. Petersburg-mystic-history.info. Retrieved on 15 July 2014. ^ Nelipa, pp. 31, 35. ^ Grigori Efimovich Rasputin. My Ideas and Thoughts. Omolenko.com. Retrieved on 15 July 2014. ^ Moynahan, pp. 37, 39. ^ Fuhrmann, pp. XXVII, 20, 53–54, 80. ^ Eyewitness Accounts – Alexis Almost Dies at Spala – 1912. Alexanderpalace. Retrieved on 15 July 2014. ^ Wilson, pp. 139, 147. 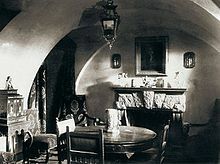 ^ Iliodor (1918). The Mad Monk of Russia. The Century Co., New York. p. 193. 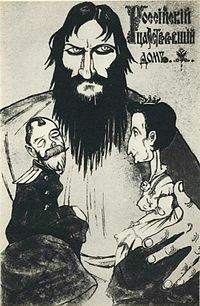 ^ Bernard Pares (6 January 1927) Rasputin and the Empress: Authors of the Russian Collapse. Foreign Affairs. Retrieved on 15 July 2014. ^ BORODINA G.YU. DOCUMENTS OF THE CASE KHIONIA GUSEVA ATTEMPT ON GRIGORIY RASPUTIN IN 1914. Retrieved on 7 August 2014. ^ Radzinsky (2000), pp. 257–258. ^ a b Rasputin, p. 12. ^ Charles A. Ruud; Sergei Stepanov (1999). Fontanka 16: The Tsars' Secret Police. McGill-Queen's Press – MQUP. pp. 297–. ISBN 978-0-7735-2484-2. https://books.google.com/books?id=TabKcOMnrc0C&pg=PA297. ^ Gerald Shelley (1925) The Blue Steppes, p. 88. ^ Antrick, pp. 35, 39. ^ Thirteen Years at the Russian Court – Chapter Eight – Journeys to the Crimea and Rumania – Poncaire's Visit – War. Alexanderpalace. Retrieved on 15 July 2014. ^ Victor Alexandrov (1966) The End of the Romanovs, trans. William Sutcliffe. Little, Brown, and Company, Boston, p. 155. ^ Robert Paul Browder; Aleksandr Fyodorovich Kerensky (1961). The Russian Provisional Government, 1917: Documents. Stanford University Press. pp. 16–. ISBN 978-0-8047-0023-8. https://books.google.com/books?id=LzWsAAAAIAAJ&pg=PA16. ^ Radzinsky (2000), p. 434. ^ Romanian Operations 1916. WarChron. Retrieved on 15 July 2014. ^ David F. Burg, L. Edward Purcell (2010). Almanac of World War I. University Press of Kentucky. ISBN 0813137713. https://books.google.com/books?id=p-NwX2siCJMC&lpg=PT120. ^ van der Meiden, p. 70. ^ van der Meiden, p. 74. ^ Nelipa, pp. 99, 223, 399. ^ Maurice Paléologue (1925).Ch. V. "December 25, 1910 – January 8, 1917" in An Ambassador's Memoirs. Vol. III. George H. Doran Company, New York. ^ a b Nelipa, p. 318. ^ Almasov, pp. 189, 210–212. ^ F. Yusupov (1952) Lost Splendor, Ch. XXIII "The Moika basement – The night of December 29". ^ Radzinsky (2000), p. 458. ^ O.A. Platonov Murder. Omolenko.com. Retrieved on 15 July 2014. ^ The Great Petrovsky Bridge (Saint Petersburg). Wikimapia. Retrieved on 15 July 2014. 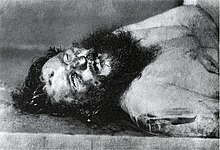 ^ Rasputin's Murder. Forum.alexanderpalace.org. Retrieved on 15 July 2014. ^ Nelipa, p. 102, 354, 529. ^ Nelipa, pp. 529, 534. ^ Nelipa, p. 379; Platonov, O.A. (2001) Prologue regicide. ^ Nelipa, pp. 529, 391. ^ Almasov, pp. 193, 213. ^ Reveals Scandals Of Old Russian Church. Ottawa Citizen. (28 November 1930). ^ "To Kill Rasputin: The Life and Death of Grigori Rasputin" by Andrew Cook. Rulit.net. ^ Alexanderpalace. Forum.alexanderpalace.org (17 July 1918). Retrieved on 15 July 2014. ^ Spy secrets revealed in history of MI6 | UK news. The Guardian. 21 September 2010. ^ Orlando Figes (2006) A People's Tragedy: The Russian Revolution: 1891–1924, p. 328-329. ^ Nelipa, pp. 424–425, 430, 476. ^ Radzinsky (2000), p. 493. ^ Amalrik, A. (1988) Biografie van de Russische monnik 1863–1916, p. 15. ^ On this day: Russia in a click. russiapedia.rt.com. The article uses a wrong date. It should be 12 July 1914. ^ a b Maurice Paléologue (1925). Ch. X. "April 1 – June 2, 1915" in An Ambassador's Memoirs. Vol. I. George H. Doran Company, New York. ^ Thirteen Years at the Russian Court – Chapter Thirteen – Tsar at the Duma – Galacia – Life at G.Q.H. – Growing Disaffection. Alexanderpalace.org (15 March 1921). Retrieved on 15 July 2014. ^ Pares, pp. 188, 222. ^ Nelipa, pp. 83, 85. ^ Rasputin, pp. 12, 71, 111. ^ van der Meiden, p. 84. ^ Andrei Zolotov, Jr. (5 February 2003) Orthodox Church Takes On Rasputin. Moscow Times.